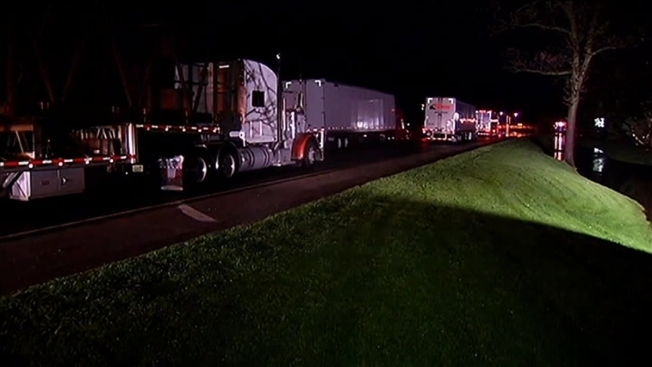 Nearly two dozen tractor trailers remained stranded along U.S. Highway 41 in Lake Bluff, north of Chicago, on Tuesday morning because of flooding. The high standing water prompted officials to close U.S. 41 from Route 137 to West Deerpath Road. Additionally, Lake Bluff School District 65 officials canceled classes because of the flooding. Just north of Route 176, water nearly touched the bottom of a railroad overpass with a sign indicating the clearance was 14 feet, 2 inches. Several passenger vehicles that had been stranded were able to turn around, but several tractor-trailers remained as of 5:00 a.m. 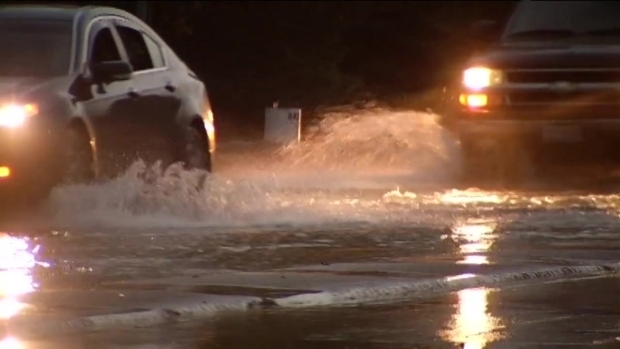 Residents in Glenview, Des Plaines and Park Ridge hope they don't see a repeat of last year's flooding. "Some of the cars were stuck in between the trucks and everything. They didn't have any idea that they could move around the frontage road over by the Rockland Office Plaza. So I helped them by basically walking them through the frontage road, around the way, so they could do a U-turn onto 176 to get to [Route] 43 and head north," said Brian Hirvela, who lives nearby. Hirvela said a police officer at 1 a.m. told him it would take about 12 hours for the water to recede, and though Hirvela said flooding in the area is fairly common, Tuesday's high waters were the worst he'd seen in the eight years he's lived in the area. "All of the other times it's actually been fairly low to some point," he said as rain continued to fall, adding that it's unknown if any vehicles were under the water. "I don't want to give any panic or anything like that but it's literally covered and we don't know if anything got stuck," he said. Drivers in some places along Route 41 chose to abandon their vehicles. Firefighters from Knollwood rescued at least six people from their cars and at least one person from a home because of the rising water. In Gurnee, Route 132 from O'Plaine Road to Greanleaf Avenue was impassable until about 6:15 a.m. due to water. In Des Plaines, several streets along the Des Plaines River had standing water, including high waters along Camp Ground Road at Miner Street. Route 137 in Grayslake was closed east of Atkinson Road, officials said. As of midday Tuesday, 4.06 inches of rain was recorded in Lake Bluff. Hebron recorded 3.82 inches, Glencoe recorded 3.56 inches and Lake Forest recorded 3.3 inches.